One of the most notable issues over time with iOS device users is that after months of use the home button becomes un-responsive, it affects all iOS devices over time and can affect some more than others, generally based upon the use of the device. One way to fix it would simply to return it to Apple and get a replacement, if your device is still in warranty and they allow you to exchange it. However as it’s a mechanical part they may not replace the device itself. A simple way that fixes the issue for most people, is something you can do yourself and all you need is your device itself. Following these simple steps will in most cases fix the problem and makes your home button a lot more responsive. Launch one of the stock iOS applications on your device, for example the settings app. When the app is open, press and hold the Sleep/Wake button at the top of the device until the ‘Slide To Power Off’ slider appears. 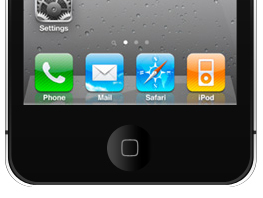 Press and hold the iOS home button. Keep the button pressed until the slider disappears and the application quiet back to the Springboard. The home button is now re-calibrated and should be a lot more responsive. This entry was posted on Wednesday, January 18th, 2012 at 10:44 AM and is filed under Apple, How To, iPAD, iPhone, iPod. You can follow any responses to this entry through the RSS 2.0 feed. You can leave a response, or trackback from your own site.